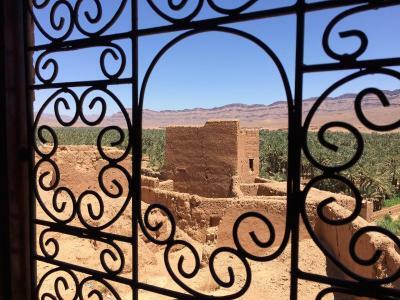 Lock in a great price for Kasbah Oulad Othmane – rated 9.2 by recent guests! A true Kasbah experience. The host and his hospitality scores highest possible rank. 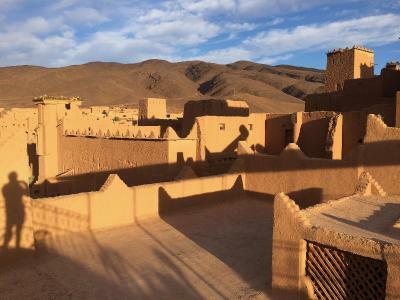 Guided tour through surrounding oasis, traditional dinner with high quality tasty food, story telling are just few attractions next to opportunity to live in authentic Kasbah. The location was beautiful, the entire kasbah was interesting regarding its architecture and history. You might see other kasbahs throughout your trip across Morocco, but this old and still cosy is unique. 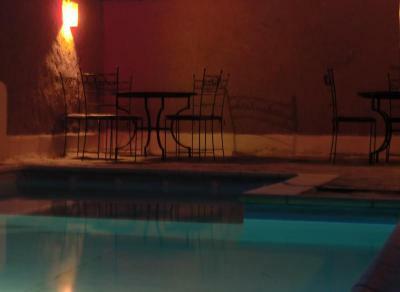 The family owns the kasbah for generations and is continuosly renovating the complex with a modern touch (pool). Dinner and breakfast were delicious and satisfying. Very warm welcome, wonderful ambience, welcome tea with cookies, delicious food. 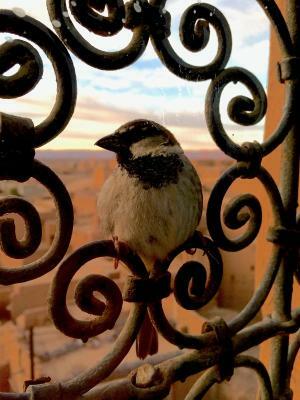 Excellent kasbah experience straight out of a fairytale! Extremely friendly owner. Living in a castle, who would not like it? The swimming pool was great with a beautiful view of rocks and palms. The breakfast and dinner was tasty. This kasbah is probably unique in being a hotel and museum-like at the same time. It is tastefully and sensibly renovated and perserved unto its details. The rooms are very comfortable clean and stylish. A great place to relax and stay well at a very reasonable cost. Across the street is a lovely palm grove to stroll in. The food was quite good. 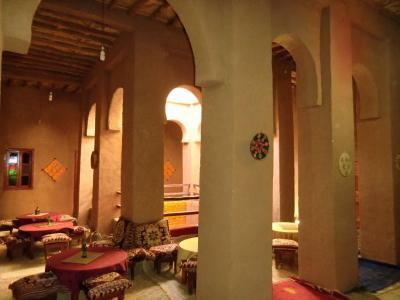 the owner has beautifully renovated and converted this kasbah into a cosy guest house. 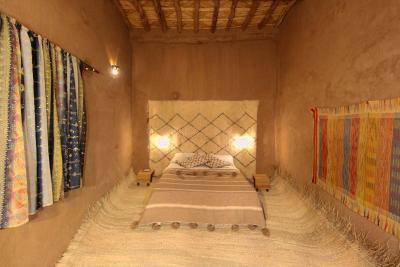 a great mix of authenticity and tradition (all mud-clay), comfort (good beds, clean bathroom, pool) and style. the tajine served for dinner was the best we had during our trip, and the tajine style eggs served for breakfast where to die for ! The owner is very nice and happy to share stories and history about the culture and traditions. He kindly gave us a tour of the old village and the palmeray, with loads of detailed explanations. Best stay of our 10 day trip ! Beautiful Kasbah to spend the night. Staff extremely friendly. Visit of the palm grove was enjoyable. Surroundings, especially the mountains, are quite the sight! 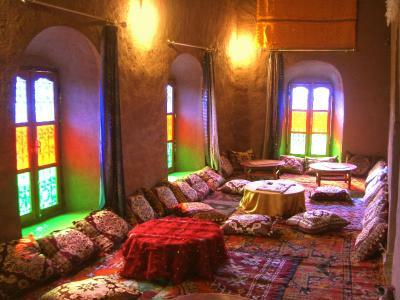 The Kasbah is located in the heart of the Drâa Valley, between Zagora and Agdz. It offers en suite guest rooms, an outdoor swimming pool and a sunbathing terrace. 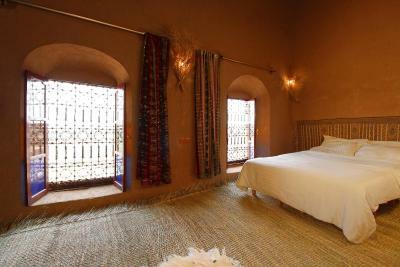 Set within an 18th-century fortress, Kasbah’s guest rooms are all colorfully decorated in a traditional Moroccan style. Some rooms overlook the village and palm grove. 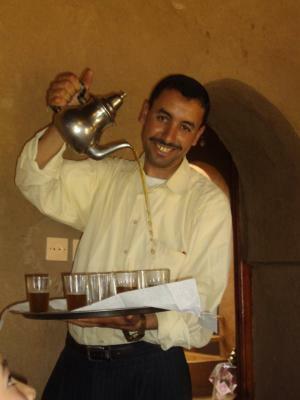 Traditional Moroccan dishes can be made to order. Meals and tea can be enjoyed on the Oulad Othmane’s terrace. Guests of the Oulad Othmane can enjoy excursions, trekking and camping in the desert as well as riding camels and 4x4s. This property also has one of the top-rated locations in Aguebt! Guests are happier about it compared to other properties in the area. This property is also rated for the best value in Aguebt! Guests are getting more for their money when compared to other properties in this city. 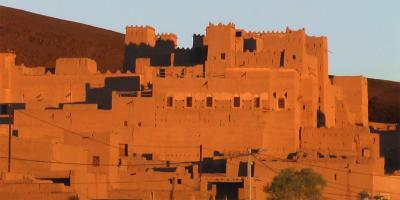 When would you like to stay at Kasbah Oulad Othmane? 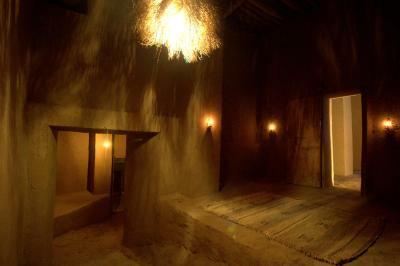 With adobe walls and wooden beams, this room offers an private bathroom with a shower. This spacious suite features a Moroccan lounge and a private bathroom with free toiletries. This spacious room features 2 stained glass windows and a private bathroom with free toiletries. House Rules Kasbah Oulad Othmane takes special requests – add in the next step! No card payment (as no landline phone in the town), but automatic deduction from card would help a lot. It is rather difficult to make yourself understood if you don't speak French or Arabic (or Berber). Dinner a little bit expensive. Fantastic experience. 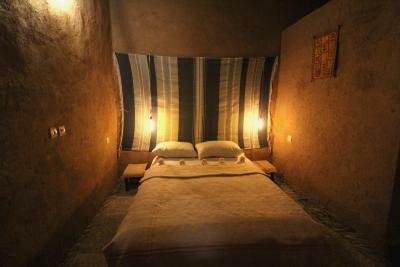 The property is located in an authentic rural Morrocan village - far away from typical, touristy places. The accommodation is located in traditional clay adobe, kept in very good shape by an extremely hospitable and friendly owner - it has been in his family hands for many generations. The rooms are clean and designed with a good taste - and with ample space (very high ceiling too!). Beds were surprisingly comfortable. As a part of the stay, delicious breakfast was served on the terrace overlooking the town, providing a magnificent, breathtaking view of the surrounding town and mountains - it was unforgettable. Access to the lovely, large relaxing area was possible as well. Hot water and Wifi are available - no problem here. We absolutely recommend this venue, you can see and feel the owner puts its own heart into it - the feeling and experience are very different than in typical 'commercial' hotels and riads. Just keep in mind this is a very traditional building in the middle of a remote community - you might be disappointed if you expect modern amenities and luxuries of a 5-star hotel here. Sometimes you hear the donkeys from the small clay town next door quite loud, but its actually a pretty funny and cool sound. This was probably the best night we had in Morocco. We would have loved to stay longer but our flight was already booked. But we are very likely to come back, as it was a unique experience. You live in a real castle from the 18th century all built by clay. On your trip through Morocco you will have seen for sure plenty of Kasbahs, most of them completely falling apart. This one is one of the very few that is actually still in use. When you come in, it really feels like you are time traveling into the 18th century and discover another world. Abdel, who owns it in the 5th generation, is a great host and we spent many hours talking about life, the town, the people, agriculture, how the castle is built and we had many ideas of what we want to do when we come back. 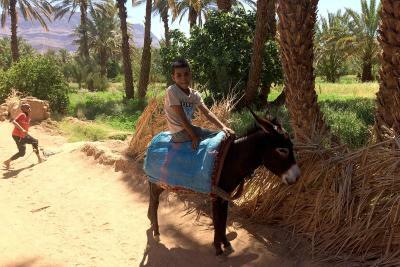 The next morning, Abdel took us for 3h into the Palmerie, a huge oasis full with date palms and we talked to many agriculture workers that were still using original methods of agriculture. We learned a lot and discovered a paradise. Behind the oasis, there is a plateau mountain that looks much bigger then the Table Mountain in Cape Town. Thanks a lot for this fantastic time! Facilities are adequate, but rather basic. The Kasbah is right next to a mosque and the muezzin woke us up early. The owner was very nice and also gave us a bons trip il the palmerie .